New Winter 2018: Here is a personalized Christmas ornament that grandparents and the grandkids love equally well, so why not get matching grandkids ornaments personalized for each? The Xmas tree fun my beautiful grandkids personalized Christmas ornament is sparkling bright in festive colors and huge smiles. 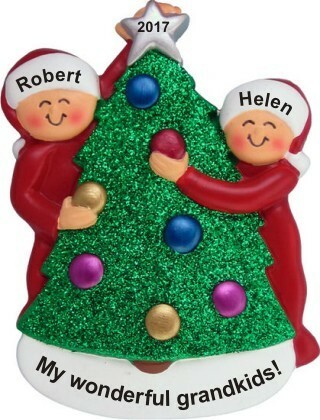 It’s a personalized grandparents ornament for 2 grandkids. Share the custom details, and a lettering pro will add them by hand in a font more attractive than shown to create a kids ornament personalized to be one of a kind. Here’s one way to make two groups happy this holiday seasons, the two grandkids personalized grandparents ornament that arrives with our custom velvet bag.